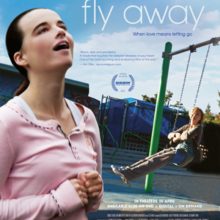 The film, by Janet Grillo, is a heart-wrenching look at the life and struggles of a single mom (Jeanne) and her teenage daughter Mandy, who is autistic. The relationship becomes an increasingly all-consuming one as Mandy adds teenage angst and hormones to her already challenging world. Jeanne struggles to stay afloat, but at what costs? How can she best advocate for her daughter, and also give her what’s best for her? It’s a stark look at the care a special-needs child requires, and the effects it can have on a family. I found the movie eye-opening in that I’ve never had a mom-of-special-needs in my circle, and it gave me huge respect for what is required, as well as given, in those circumstances. If any of you can vouch for how fair a portrayal it is, I’d love to hear. It certainly made me feel thankful for the amount of support I have in my parenting, and hats off to all you single parents, I truly don’t know how you do it! As I sat through the credits, chewing on a few things (I have older family who’ve adopted special needs), it dawned on me how empty the theatre really was … there were only two others besides my girlfriend and I. As the lights came up, they both got slowly to their feet, straighted stiff backs, and shuffled off to the bathroom. Both were males well into their medicare days, and I found my interest piqued. They had as much reason as anyone to be there I suppose, but I was dying to know what brought them. Could they relate to Jeanne’s struggle to decide how to best care for her daughter? Regrets? No clue. I sometimes go off on great wonderings about other people’s lives, and wished I could have asked them, but it seemed pretty invasive to do so, so I’m left with my thoughts. We followed the movie up with a late/light dinner at Northern Spy, and oh was it good! Not for vegetarians though, everything is rich in fats and there’s lots of meat. Thinking about the duck-fat fries when I’ve been blogging instead of making dinner was not a wise move, so I better end it there.